Total nonfarm payroll employment increased by 228,000 in November, and the unemployment rate was unchanged at 4.1 percent. Over the year, the unemployment rate and the number of unemployed persons were down by 0.5 percentage point and 799,000, respectively. Among the major worker groups, the unemployment rate for teenagers increased to 15.9 percent in November. The jobless rates for adult men (3.7 percent), adult women (3.7 percent), Whites (3.6 percent), Blacks (7.3 percent), Asians (3.0 percent), and Hispanics (4.7 percent) showed little change. The number of long-term unemployed (those jobless for 27 weeks or more) was essentially unchanged at 1.6 million in November and accounted for 23.8 percent of the unemployed. Over the year, the number of long-term unemployed was down by 275,000. “November marked another impressive month for the labor market, adding up to now over 2 million net new jobs over the past 12 months,” said NAR Chief Economist Lawrence Yun. “From the deep recession in 2010, 17 million new jobs have been created. In fact, current employment levels are way above the pre-recession levels by nearly 10 million. “That means an abundance of new potential homebuyers in the near future. Yet, the construction employment is still slow in coming. Even the though the latest month’s job growth rate in the construction sector of 2.7 percent is twice as fast as the overall growth rate, total construction jobs are still well below the pre-recession levels by roughly 20 percent. 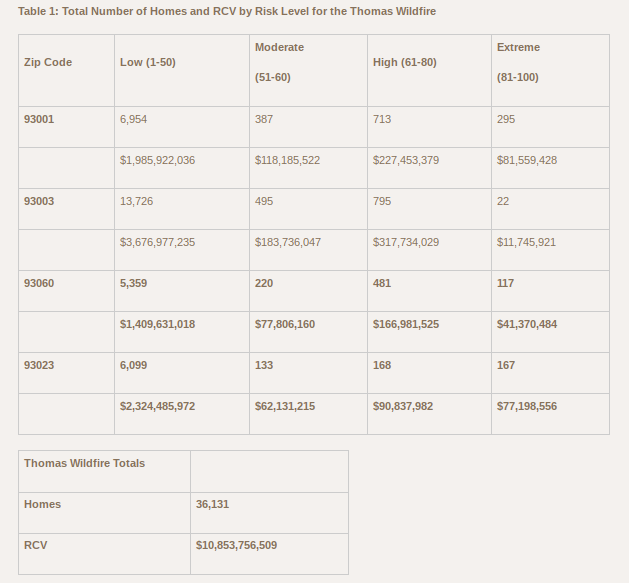 A total of 86,242 homes in Ventura and Los Angeles counties with a combined reconstruction cost value (RCV) of $27.7 billion are at some level of risk from the Thomas, Rye and Creek Wildfires. 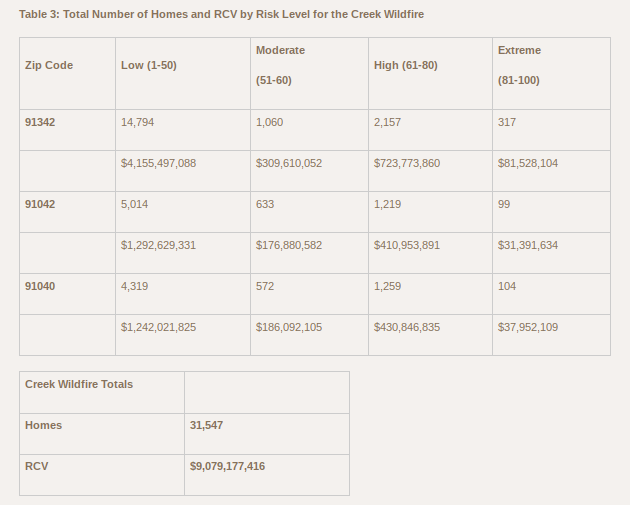 Of the total at-risk homes, 13,526, or 16 percent, with an estimated RCV of more than $5 billion are at significant risk of damage, falling in the High and Extreme risk categories, according to CoreLogic data. 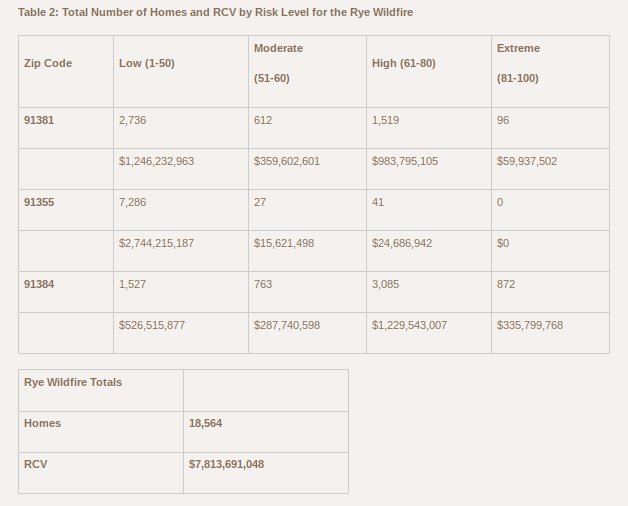 Although the majority of homes, 72,716, or 84 percent, are at Low or Moderate risk of damage, wildfire can easily expand to adjacent properties and cause significant damage even if a property is not considered high risk in its own right. The MCAI increased 0.8 percent to 182.4 in November. 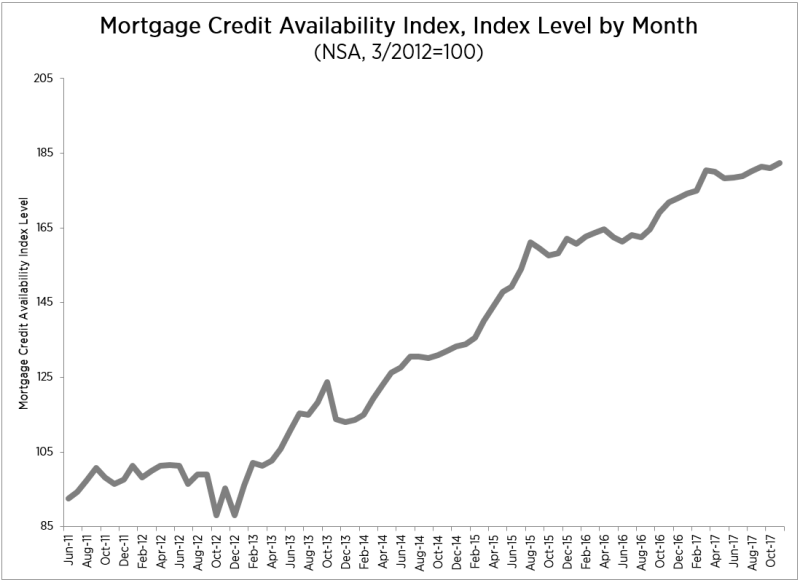 A decline in the MCAI indicates that lending standards are tightening, while increases in the index are indicative of loosening credit. Of the four component indices, the Jumbo MCAI saw the greatest increase in availability over the month (up 3.8 percent), followed by the Conventional MCAI (up 2.8 percent), and the Conforming MCAI (up 1.8 percent). The Government MCAI (down 0.7 percent) decreased from last month. “Mortgage credit availability increased in November driven by a net increase in investor offerings,” said Lynn Fisher, MBA’s vice president of research and economics. U.S. homeowners with mortgages (roughly 63 percent of all homeowners) have seen their equity increase by a total of $870.6 billion since Q3 2016, an increase of 11.8 percent, year over year. In Q2 2017, the total number of mortgaged residential properties with negative equity decreased 9 percent from Q2 2017 to 2.5 million homes, or 4.9 percent of all mortgaged properties. Compared to Q3 2016, negative equity decreased 22 percent from 3.2 million homes, or 6.3 percent of all mortgaged properties. The national aggregate value of negative equity was approximately $275.7 billion at the end of Q3 2017. This is down quarter over quarter by approximately $9.1 billion, or 3.2 percent, from $284.8 billion in Q2 2017 and down year over year by approximately $9.5 billion, or 3.3 percent, from $285.2 billion in Q3 2016. In Q3 2017, the average homeowner gained approximately $14,900 in equity during the past year. Washington had the highest year-over-year average increase at $40,000. No states posted a decrease. “Homeowner equity increased by almost $871 billion over the last 12 months, the largest increase in more than three years,” said Frank Nothaft, chief economist at CoreLogic. 30-year fixed-rate mortgage (FRM) averaged 3.94 percent with an average 0.5 point for the week ending December 7, 2017, up from last week when it averaged 3.90 percent. A year ago at this time, the 30-year FRM averaged 4.13 percent. 15-year FRM this week averaged 3.36 percent with an average 0.5 point, up from last week when it averaged 3.30 percent. A year ago at this time, the 15-year FRM averaged 3.36 percent. 5-year Treasury-indexed hybrid adjustable-rate mortgage (ARM) averaged 3.35 percent this week with an average 0.3 point, up from last week when it averaged 3.32 percent. A year ago at this time, the 5-year ARM averaged 3.17 percent. 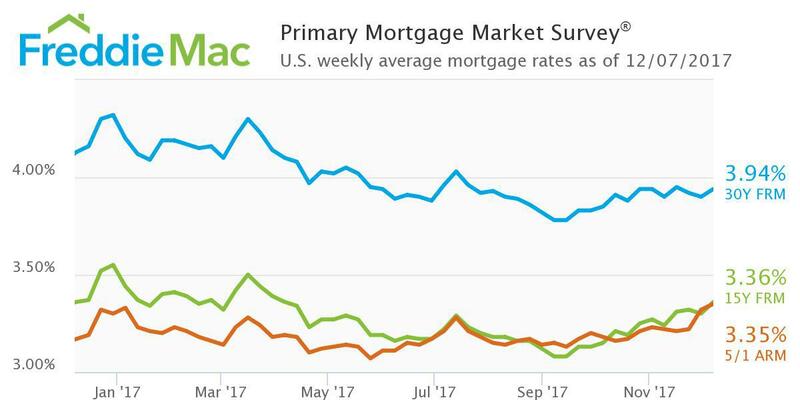 “This week’s survey reflects last week’s uptick in long-term interest rates, with the 30-year fixed mortgage rate up 4 basis points to 3.94 percent,” said Len Kiefer, deputy chief economist at Freddie Mac. “While long-term rates have been relatively steady week-to-week, shorter term interest rates have been on the rise. The spread between the 30-year fixed mortgage and the 5/1 Hybrid ARM rate was 59 basis points this week, down 43 basis points from earlier this year. The 30-year fixed mortgage rate on Zillow Mortgages is currently 3.70 percent, down three basis points from this time last week. The 30-year fixed mortgage rate hovered around 3.74 percent for most of the past week before dipping to the current rate on Wednesday. The rate for a 15-year fixed home loan is currently 3.10 percent, and the rate for a 5-1 adjustable-rate mortgage (ARM) is 3.22 percent. The rate for a jumbo 30-year fixed loan is 3.95 percent. “Mortgage rates edged higher early last week with the passage of the Senate’s tax reform bill, which would imply greater federal borrowing over the next decade, and news of two new Fed members with less-known monetary policy views,” said Aaron Terrazas, senior economist at Zillow. “Friday’s employment report is the most important piece of economic data due this week, though markets will also closely watch the final contours of the tax reform bill as negotiations get underway between the House and Senate. “Rates could rise sharply if Congress fails to enact a resolution to continue funding the federal government later this week,” added Terrazas. 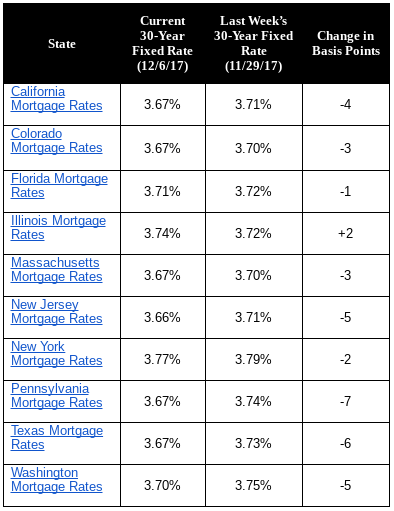 November’s best offers for borrowers with the best profiles had an average APR of 3.75 percent for conforming 30-year fixed purchase loans, unchanged from October. Refinance loan offers were down 1 basis point to 3.69 percent. Mortgage rates vary dependent upon parameters including credit score, loan-to-value, income and property type. For the average borrower, purchase APRs for conforming 30-year fixed loans offered on LendingTree’s platform were down 1 basis point to 4.30 percent, the lowest since November 2016. In contrast, the loan note rate of 4.18 percent was unchanged from October when it reached the highest since July. 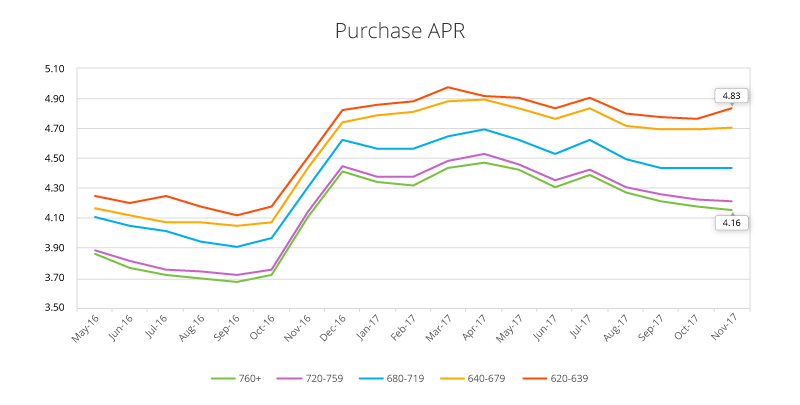 Consumers with the highest credit scores (760+) saw offered APRs of 4.16 percent in November, versus 4.43 percent for consumers with scores of 680-719. The APR spread of 27 basis points between these score ranges was 5 basis points wider than in October and the widest since July 2016. The spread represents nearly $13,400 in additional costs for borrowers with lower credit scores over 30 years for the average purchase loan amount of $233,127. Refinance APRs for conforming 30-year fixed loans were down 2 basis points to 4.24 percent. 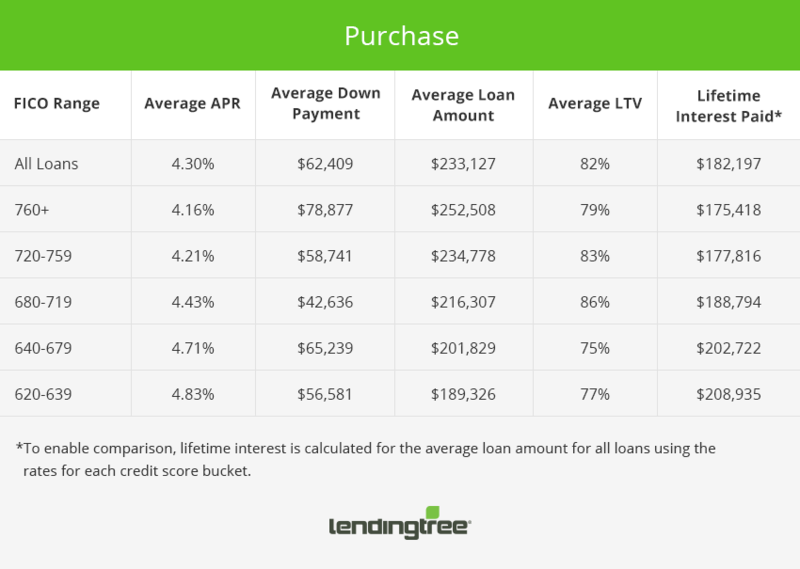 The credit score bracket spread widened to 19 from 16 basis points, amounting to $9,500 in extra costs over the life of the loan for lower credit score borrowers given an average refinance loan of $235,973. Average proposed purchase down payments have been rising for 8 months and reached $62,409. Mortgage applications increased 4.7 percent from one week earlier. The prior week’s results included an adjustment for the Thanksgiving holiday. The Market Composite Index, a measure of mortgage loan application volume, increased 4.7 percent on a seasonally adjusted basis from one week earlier. On an unadjusted basis, the Index increased 47 percent compared with the previous week. The Refinance Index increased 9 percent from the previous week. The seasonally adjusted Purchase Index increased 2 percent from one week earlier. The unadjusted Purchase Index increased 38 percent compared with the previous week and was 8 percent higher than the same week one year ago. The refinance share of mortgage activity increased to its highest level since September 2017, 51.6 percent of total applications, from 48.7 percent the previous week. The adjustable-rate mortgage (ARM) share of activity decreased to its lowest level since January 2017, 5.7 percent of total applications. The FHA share of total applications increased to 11.1 percent from 10.8 percent the week prior. The VA share of total applications decreased to 10.7 percent from 11.0 percent the week prior. The USDA share of total applications remained unchanged from the week prior at 0.8 percent. The average contract interest rate for 30-year fixed-rate mortgages with jumbo loan balances (greater than $424,100) increased to 4.16 percent from 4.14 percent, with points increasing to 0.28 from 0.27 (including the origination fee) for 80 percent LTV loans. The average contract interest rate for 30-year fixed-rate mortgages backed by the FHA increased to 4.11 percent from 4.07 percent, with points increasing to 0.40 from 0.37 (including the origination fee) for 80 percent LTV loans. The average contract interest rate for 15-year fixed-rate mortgages increased to 3.59 percent from 3.57 percent, with points increasing to 0.48 from 0.40 (including the origination fee) for 80 percent LTV loans. The average contract interest rate for 5/1 ARMs increased to 3.48 percent from 3.42 percent, with points decreasing to 0.46 from 0.58 (including the origination fee) for 80 percent LTV loans. The national delinquency rate saw its second consecutive annual rise as Hurricanes Harvey and Irma continued to impact the mortgage market. Overall, delinquencies ticked up 4 basis points from September (a rise that can be directly linked to the storms), while delinquencies fell 14 basis points in non-hurricane impacted areas. Though delinquencies fell in every state except Texas and Florida, in FEMA-declared Harvey and Irma disaster areas, they rose 24 percent (186 basis points). In hurricane-affected areas in Florida, delinquencies climbed an additional 36 percent from September. Over 229,000 past-due loans can now be attributed to Irma (163,000) and Harvey (66,000) representing over 10 percent of the national delinquent loan population. Prepays rebounded from September’s 15 percent drop, climbing 17 percent month-over-month; even so, they were still down more than 25 percent from last year. The total number of loans in active foreclosure fell below 350,000 for the first time since 2006, bringing the national foreclosure rate to 0.68 percent. 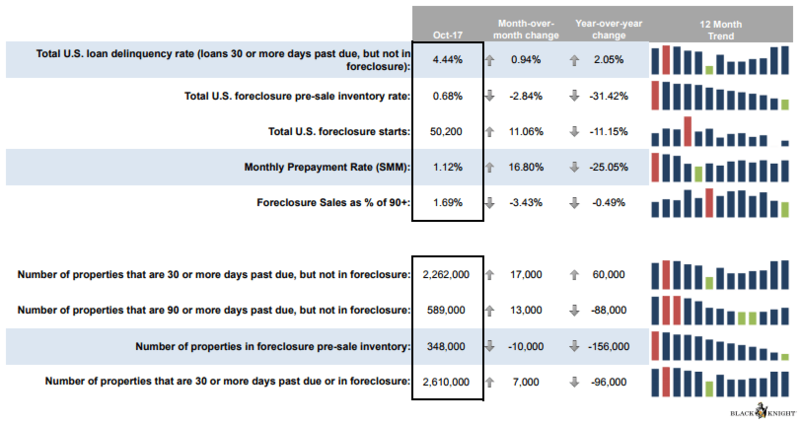 Though up 11 percent over September, October’s 50,200 foreclosure starts mark the second lowest number of monthly starts since 2004. View the full report for information on the tax reform impact on mortgage and housing markets.